I understand that looking for the perfect memory foam mattress can be an arduous journey. In fact, it can leave you feeling the need to take yourself off to bed! I was in the same place as you once, and I know what you’re going through which is why all the reviews on my website get straight to the point. For his particular page I’m going to tell you about the LUCID 10 inch memory foam mattress from LinenSpa. I will start with one thing that’s probably top of your list when searching for a mattress like this and that’s price. This model has plenty of features you will find with larger brands but it will cost you mere hundreds instead of thousands of dollars. So now you know the price won’t make you fall of your chair, let’s deal with what you can expect from this memory foam mattress. Next to price, this is always top of everyone’s list. After all, that’s why you’re looking into the idea of a memory foam mattress. 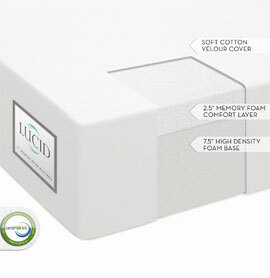 As you know, this mattress is 10 inches in depth and that’s made up of the following: 7 ½ inches of high density foam at the base and 2 ½ inches of the LUCID memory foam comfort layer. This one will not deal with medically challenging aches and pains, but if you do fall into this bracket of people I would advise you speak with a doctor before you make any changes to your sleeping arrangements. However, this mattress will definitely help realign your spine and improve posture, which in turn relieves various mild aches and pains many of us suffer from with our upper and lower backs. The manufacturer states this memory foam mattress has a medium to firm feel, but I must explain this won’t be the same for everyone. If you’re of an average weight, no problem. However, if you’re heavier than average you might find it a little too firm. Plus, I have come across issues with lasting indentations which, again, tends to happen with people who are of a heavier build. All is not lost though because if you know and like this brand, I have also reviewed the 12″ LUCID by LinenSpa on another section of my website. This one might suit you better if you prefer a softer mattress, and it will help eliminate issues with indentations for those of you who are on the heavier side. With the 10 inch model you have the added benefit of “open cell” memory foam which helps to stop motion transfer between sleeping partners and it will eventually help reduce the amount of tossing and turning many active sleepers do. I’m well aware that a lot of people are wary of buying a memory foam mattress because of the odor they can produce when they’re new. However, this one is CertiPUR-US approved which means all of the materials used are rigorously tested, do not deplete the ozone and don’t contain any potentially harmful chemicals that can be bad for your health and the environment. When you first receive this mattress, it will arrive in its own box and is rolled and vacuum packed. I will point out one thing (and I have no idea why this is) but the mattress will roll out with the underside on top. A simple flip will ensure you sleep on it the right way up. For the average person, setting it up ready for expansion can take as little as 5 minutes. Some do complain about an odor while the mattress expands, whilst others don’t. If you are sensitive to this, keeping a window open and making sure you don’t use the mattress until fully expanded will help to stop this problem. You can buy this mattress in a variety of sizes including Twin, Full, Full XL, Olympic Queen, Queen and King. You can also buy it in California King, Twin XL and Short Queen so there should be a size to suit all. The manufacturer offers a 25 year warranty, but there are limits. Having said that this mattress (in my opinion) is great at conforming quickly to the contours of your body, will help with minor aches and pains, and best of all will not cost you the earth! If you’re interested in finding out more about what others have to say (there are plenty of them) and what great savings you can make on the price, take a peek at Amazon.